This Barbecue Pork Chop Recipe relies heavily on a rub from the staple spice of Hungary – Paprika, to deliver a colourful crisp spicy coating to your chops. Indeed it was in Hungary that I first saw this style of rub prepared. Picture the scene in 1990 at the Hungaroring. “Il Leone” Nigel Mansell drove his Ferrari to a fantastic victory in the Hungarian Grand Prix! What better way to celebrate than with my newly anointed Magyar barbecue pork chop recipe? Well if you can't or don't want to picture the scene then just crack on with the recipe. Paprika is a spice used not just in Hungary but all over Europe, what's great about the way it is used in this really is the absolute simplicity. 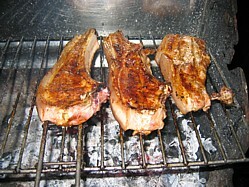 To be honest it works just as well with pork shoulder steak as well but if you can get loin chops then all the better. When selecting your meat it should be pink, moist and the fat should be white. Mix all the ingredients other than the pork chops together in a bowl and when thoroughly mixed, sprinkle sparingly on both sides of the chops or steaks. Use just a light dusting, you want the paprika to add flavor but if you use too much you'll end up with a dry crust on the chop that over-powers everything else. Any of the rub that you don't use can be stored in an airtight container and used another time. Give the chops 10 minutes just to let the rub "soak in" a little and then you are ready to cook. Place the chops on the BBQ grill over medium coals for about 10 – 12 minutes depending on the thickness of your chops turning at half time. If using a temperature probe then look for 70°C or 160°F. When you reach this temperature, take them off the grill and allow them to rest for 5 minutes. Sprinkle with a little sea salt flakes and your ready to go. I served mine with mashed potato and steamed seasonal veg. If rubs are your thing, there's loads more to check out in the Barbecue Rubs section.